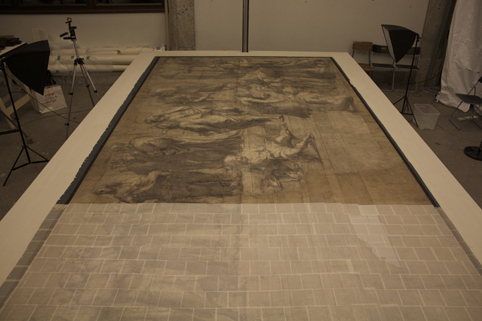 Remarkably, one of the most recognizable works of art of the High Renaissance survives on two huge pieces of cardboard, comprising 210 sheets of paper in total. 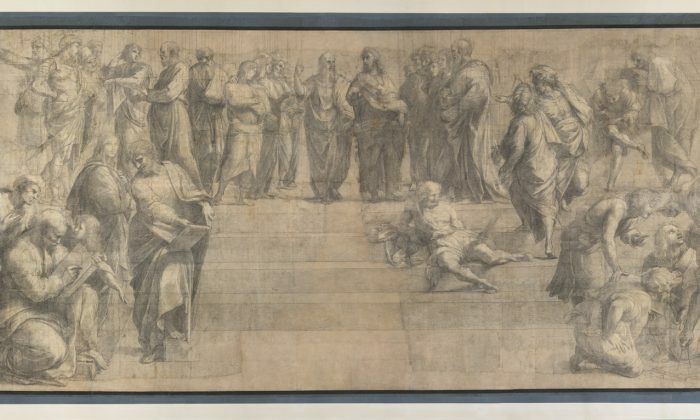 At 9 feet, 4 inches by 26 feet, 4 1/2 inches, the cartoon or preparatory drawing for Raphael’s “School of Athens” was publicly unveiled on March 27, 2019, at the Ambrosiana Gallery in Milan, Italy, after four years of restoration. 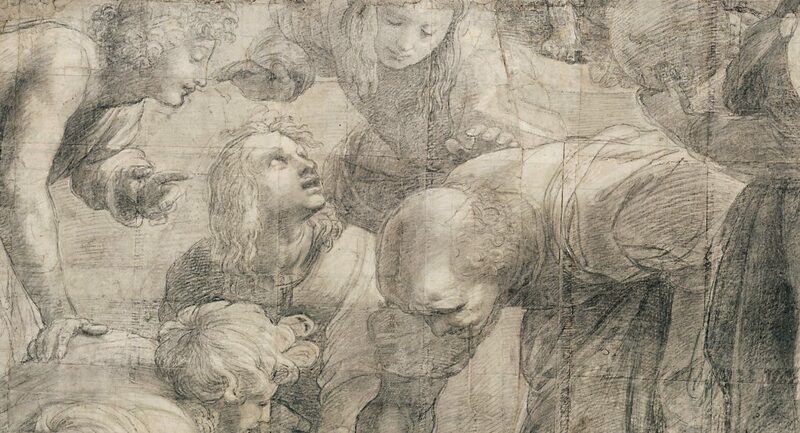 The restored “Philosophy” cartoon can now be viewed in the exhibition “Il Raffaello dell’Ambrosiana. In principio il Cartone” (“Raphael of the Ambrosiana. 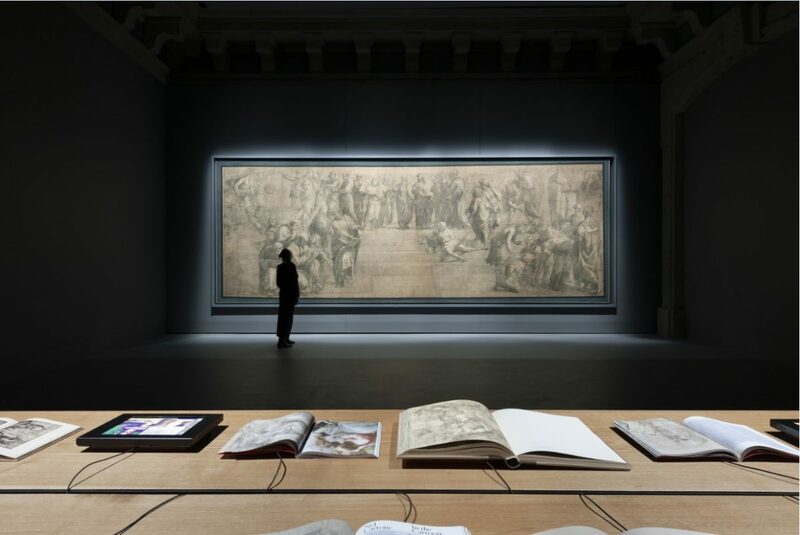 The Original Cartoon.”) On April 6, the 499th anniversary of Raphael’s death, visitors at the Ambrosiana Gallery can view the astonishing cartoon for free. The cartoon underwent extensive study in 2014 by the Venerable Ambrosiana Library, through the Cardinal Federico Borromeo Foundation, which led to its conservative restoration coordinated by a prestigious Scientific Committee. 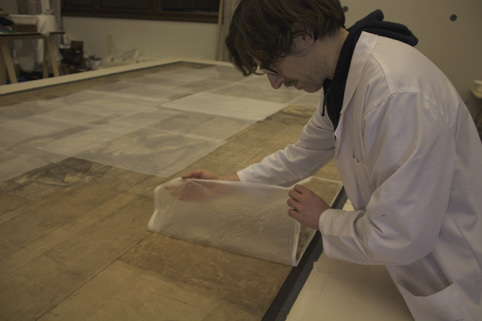 The restoration was directed and coordinated by Dr. Maurizio Michelozzi. Not only has the actual artwork been restored, but the gallery space has also been redesigned and the cartoon frame remade. 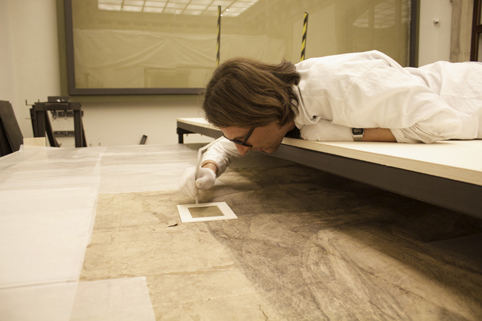 Visitors can now get closer to the artwork, with just a piece of glass separating them from the delicate marks made by the hand of Raphael. 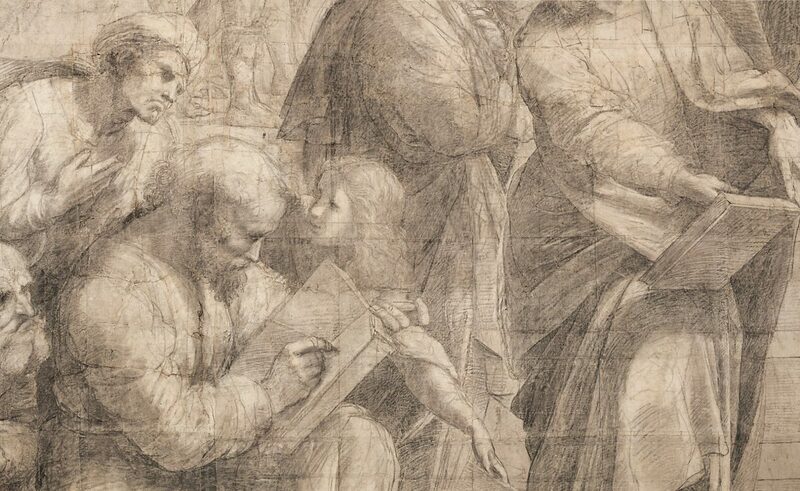 What’s wonderful about this particular piece of art is that not only is it completely hand-drawn by Raphael alone, a rarity in itself, but it is not a typical cartoon. 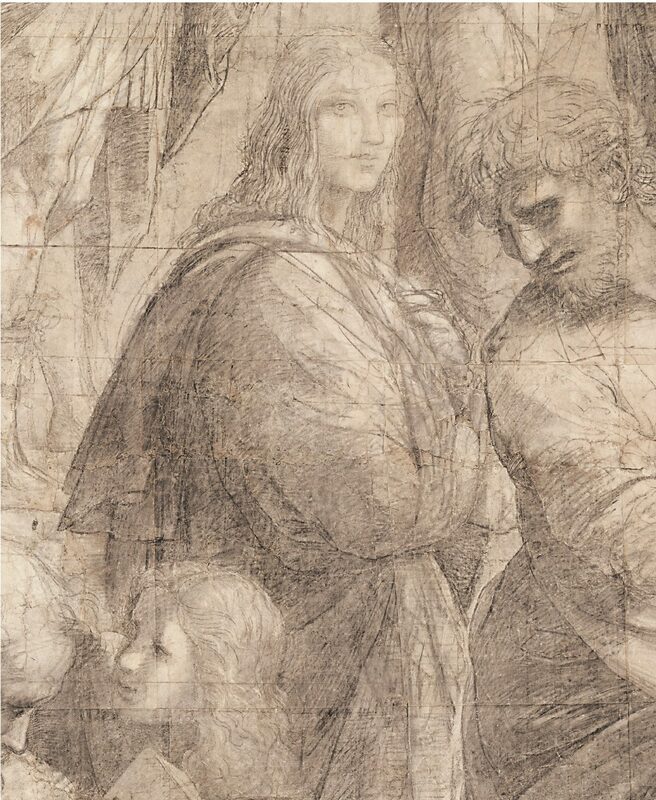 Usually, a cartoon, derived from the Italian word “cartone” meaning paper, is a detailed preparatory drawing used to transfer an image in order to paint a fresco or make a tapestry. 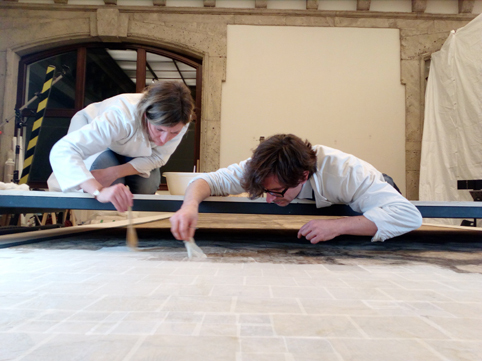 A cartoon would have been transferred to a surface by applying a series of small pinpricks to it and then using charcoal or chalk to dab over the holes. Or chalk or charcoal could have been applied to the underside of the cartoon and a stylus used to indent or imprint the design onto the surface. It makes sense then that, invariably, cartoons are not always in good condition—if they survive at all. This transfer process did not happen to this cartoon. It was only ever meant to show the complete design to the pope. Raphael cleverly points Plato’s finger up to the heavens, a nod to the fact that Plato believed the true world to be in the spiritual realm. 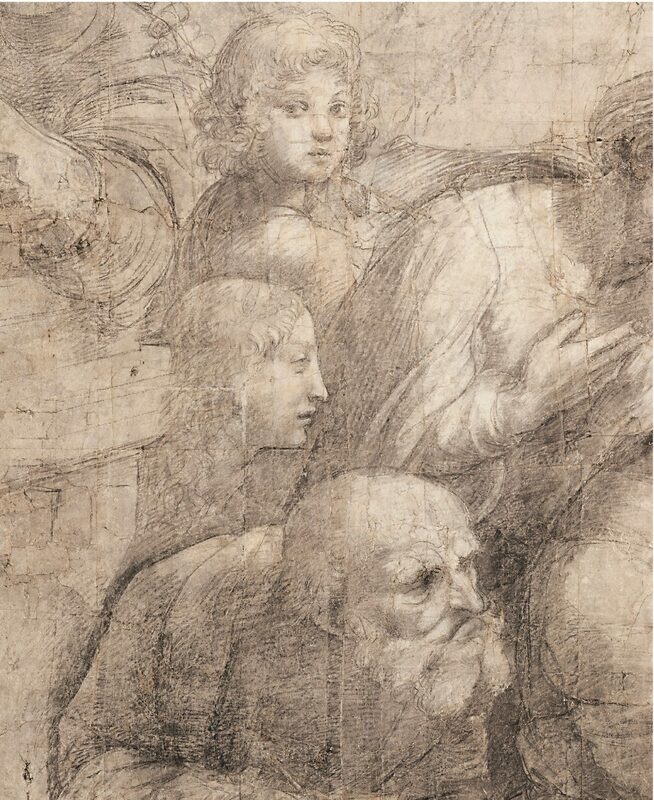 Raphael has placed Aristotle’s hand parallel to the earth while at the same time reaching out to the viewer, as if to connect with the material. This pose equates to Aristotle’s belief that life needed to be experienced in order to gain evidence, understanding, and knowledge. High on the walls depicted in the “School of Athens,” two statues stand in the niches on either side of the central figures. A statue of Apollo is at Plato’s right side, and Athena is on Aristotle’s left. Apollo, the god of light, truth, the sun, healing, prophecy, and poetry, holds his lyre, showing that he is also the god of music. Athena is the goddess of wisdom, commerce, war, medicine, handicrafts, poetry, and the arts in general. Figures on the left of the painting lean toward Plato’s school, and those to the right of the painting represent Aristotle’s thinking. Socrates can be seen in profile to the direct left of Plato. His distinctive features align with his busts from antiquity. In the cartoon, he can be seen reasoning with those students around him, just as he would have done when he taught Plato. Further down on the same side, Pythagoras is sitting hunched over a book, immersed in writing, as a small crowd gathers round to listen. All seem eager not to miss a word. Not all of the philosophers could have been copied from antique art, nor would they have been as recognizable as Socrates. 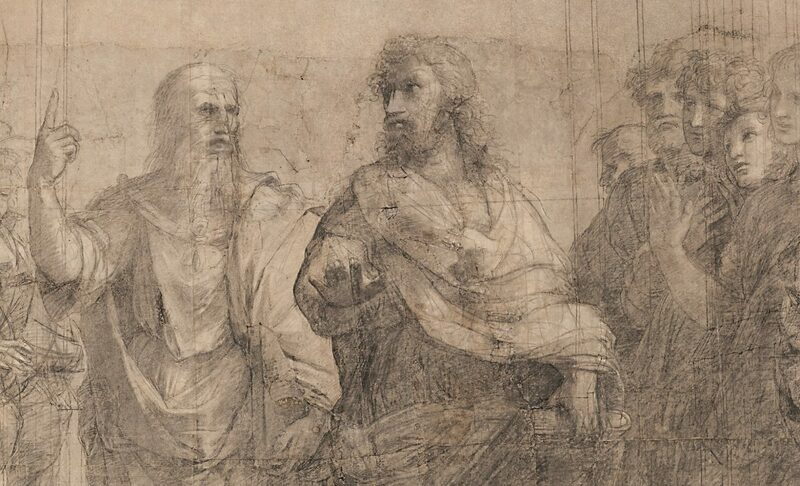 Experts agree that some of the philosophers’ faces that Raphael drew in “Philosophy” are represented by his friends and contemporaries in the arts. Look to the right side of the painting, directly in line with Pythagoras, and there is the mathematician Euclid, the founder of geometry. 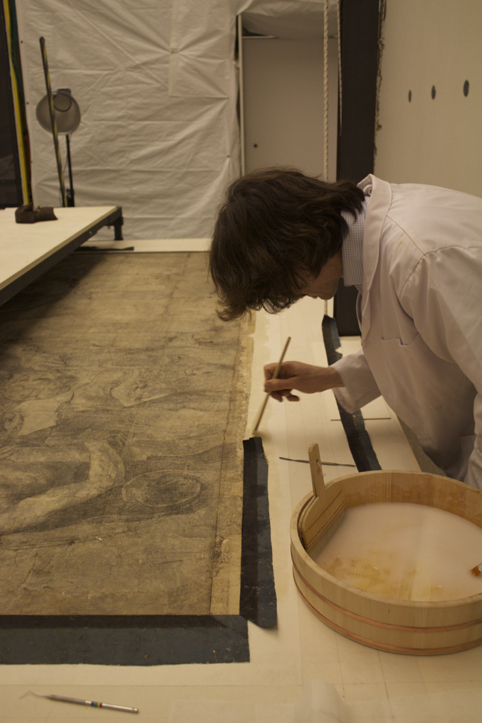 He’s hunched over a slate, measuring or demonstrating a diagram with a compass. His face is actually that of Donato Bramante, a friend of Raphael’s and the architect who created the High Renaissance style of architecture. 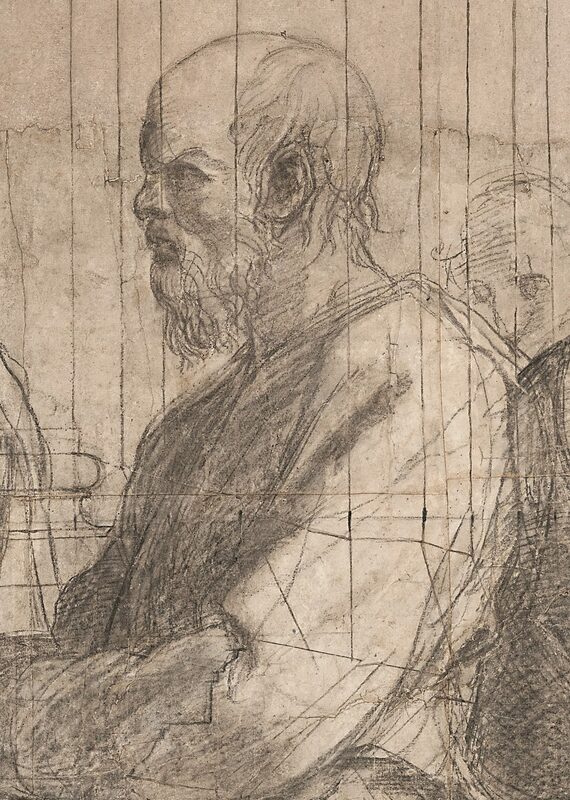 Bramante would have used mathematics to draft his designs. Most of the figures are communing in small groups, in what seem like fascinating debates and dialogues. There are a few notable exceptions. One is Hypatia, the female figure in the group around Pythagoras. She stares out into the viewer’s space. Detail of the “School of Athens,” by Raphael (Raffaello Sanzio). Cardboard, charcoal and white lead. Last year the world celebrated the 500th anniversary of the “Sistine Madonna,” the work of Italian Renaissance artist Raphael.